This past Friday, an Orange County court found ten students guilty of, as one article put it, “being mean to Israeli ambassador” Michael Oren. Their prosecution constitutes an attack on Muslims and all people of conscience, and will have serious implications for Islamophobia, freedom of speech, and the future of Palestine solidarity activism. Because of all that is at stake, the students and their community are not taking this attack lying down, but are struggling to appeal the verdict and turn this defeat into a victory for justice. On February 8, 2010, Israeli ambassador Michael Oren spoke at UC Irvine. His talk came a little over a year after Israel’s brutal assault on Gaza that left over 1,400 Palestinians (mostly civilians) dead and over 5,000 wounded, in which Oren had served in the IDF as a military propagandist. Ten students from UC Irvine and nearby UC Riverside, outraged by Oren’s complicity in Israel’s war crimes and inspired by an earlier protest at the University of Chicago, disrupted his speech by standing and shouting brief statements like “You, sir, are an accomplice to genocide!” After shouting for no more than 10-15 seconds each, the students left the auditorium and did not resist arrest by campus police. After the tenth had made his statement, a group of their supporters left the auditorium en masse, and an eleventh student was arrested for leading them in a chant of “Whose university? Our university!” The eleven arrested students came to be known as the Irvine 11. The students were all disciplined by their universities, and from a legal perspective the issue should have ended there. However, Orange County district attorney Tony Rackauckas decided to make an example of these student protesters in order to criminalize dissent and pander to his right-wing base of support. After waiting until nearly the very end of the statute of limitations, in January 2011 Rackauckas convened a grand jury to investigate bringing criminal charges against the protesters. He eventually charged them with two misdemeanors: ‘disturbing a public meeting,’ and the decidedly Orwellian charge of ‘conspiracy to disrupt a public meeting.’ Criminalizing dissent was nothing new for the DA; for example, in 2005 he attempted to stick trumped-up charges on six young people of color at a protest against the racist Minutemen Project in Garden Grove. The protesters fought the charges in court and eventually won. But this time the DA was not only seeking to stifle protest, but to stir up Islamophobia as well. Southern California is home to one of the largest Muslim communities in the United States, but Orange County in particular has long been a bastion of the Right. Mere days after the DA formally charged the Irvine 11, in February 2011, hundreds of Islamophobic bigots showed up to protest the Islamic Circle of North America’s fundraiser in Orange County for a women’s shelter. The racist mob was joined by several elected Republican politicians as they hurled abuse and slurs at the charity event’s attendees; city councilwoman Deborah Pauly even threatened them with violence, saying “I know quite a few Marines who will be willing to help these terrorists to an early meeting in paradise.” These bigots were emboldened to act by the Islamophobic atmosphere created in part by the DA’s selective prosecution of the Irvine 11. Immediately after the arrests made at UC Irvine in February 2010, activists sprang into action to defend the Irvine 11. Calling themselves ‘Stand With the Eleven,’ the campaign was made up primarily of young friends, classmates, and supporters of the Irvine 11. They put their social media savvy to work, quickly setting up a website as well as a Facebook page and Twitter account, but also establishing a presence on the ground, holding townhall meetings and reaching out to local mosques and community centers. Stand With the Eleven organized a petition drive and letter-writing campaign calling for the DA to drop all charges against the Irvine 11, and held a protest and press conference outside the DA’s office. They also sought support from across California and the world, collecting donations for the legal defense and getting letters of support from the faculty and student governments of various University of California campuses as well as sundry community and interfaith leaders. The DA offered to drop the charges against the eleventh student arrested (who had not participated directly in disrupting the Israeli ambassador’s speech) in exchange for community service, but refused to drop the charges against the other ten students. As the trial finally began in September 2011, Stand With the Eleven mobilized hundreds of supporters to come out to the courthouse. The Orange County DA assigned Dan Wagner, the head of his homicide unit, as the prosecutor in the Irvine 11 trial. (Apparently there were no homicides in Orange County he needed to investigate). The prosecutor took the DA’s approach of depoliticizing the case, playing up the religious factor by asking a witness to testify whether the defendants prayed before the protest and to describe their prayer, and seeking to remove this protest from the larger context of student protest as a whole at UC Irvine and other universities. The judge bought into this disingenuous depoliticization, claiming that protests against tuition hikes and budget cuts at UC Irvine were “irrelevant” and refusing to allow the defense to address them, despite the fact that some of the Irvine 11 had participated in such protests, and that all of them saw themselves as part of a tradition of student protest and a movement that made connections between occupation in Palestine, austerity measures in Irvine, and other issues. Indeed, student protest itself was on trial in the courtroom, especially in the prosecutor’s closing statements which Shakeel Syed of the Islamic Shura Council of Southern California called “political theater.” The prosecutor argued that the student protesters should have adopted a different tactic, such as silent protest– ignoring the fact that a silent protest outside the DA’s office, held in March 2011 by Irvine 11 supporters with tape over their mouths, failed to get a response or even acknowledgement from the DA. 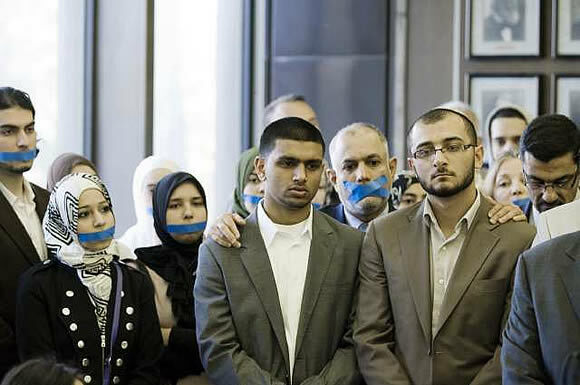 One had to wonder what kind of justice ten young Muslim men, one of whom named Osama, could hope to get from a jury drawn from the racist jury pool of Islamophobic Orange County in a trial that began the day after the 10th anniversary of 9/11. Not much could be expected from the same court system that lynched a Black man the same week a verdict was reached in the Irvine 11 case. Yet the verdict was an outrage to supporters all the same: guilty on both charges. The ten protesters were sentenced to pay a fine, perform 56 hours of community service, and be subject to three years of informal probation, which would be commuted to one year if the community service was finished by January 2012. At a press conference following the sentencing on Friday, September 23, and a townhall meeting held the following Sunday, the Irvine 11 announced their intent to appeal the verdict, taking it to the Supreme Court if necessary. Though the DA succeeded in punishing ten men for protesting, he was not able to frighten the Muslim and pro-Palestinian community into quiet acquiescence. A year and a half after the initial protest, they are better organized and more resolved than ever. At Sunday’s townhall meeting, some of the Irvine 11 spoke of their generation breaking with the quietism and fear that had kept some of the elders in their community away from political protest. Rather than being intimidated by their prosecution, these young men have been inspired by the support they received to become more active, more outspoken for justice. The lesson for Orange County’s Muslims, Palestine solidarity activists, and dissidents in general, is clear: if you speak out, you might face repression, but your community will have your back and will stand with you through it. As the Irvine 11 continue their struggle for justice, they will shine as an example and inspiration for future generations of protesters in Orange County who refuse to be intimidated. To learn more about the Irvine 11 or to make a donation to their substantial legal fees, please visit www.Irvine11.com. Eskandar is a student and activist at UC Irvine.